Huracan Super Trofeo Collector 2019 edition is only for the track. We've grown accustomed to automakers like Lamborghini doing special editions of their road-going production vehicles. The Gallardo, for example, yielded more special editions than we'd care to count – and that's before you get into all the powertrain and body-style combinations in which it was offered over the course of its decade in production. But this latest isn't a road-going production model. It's a race car. The new Collector 2019 edition is based on the Lamborghini Huracan Super Trofeo Evo – the racing version of the Gallardo's successor and the rolling backbone of the marque's in-house racing series. Though it was unveiled in Geneva last week, the Huracan Super Trofeo Evo Collector 2019 edition wasn't presented at the auto show. Instead it was showcased at the headquarters of Roger Dubuis, the watchmaker with which Lamborghini has partnered. As such, it features the design of one of Dubui's watch movements on the roof – specifically the one that powers the Excalibur Huracan Performante edition timepiece (of which the watchmaker will only make 88 examples). It also features a rather handsome black and gold livery, designed by Lamborghini's Centro Stile studio, and vaguely reminiscent of the iconic Lotus/JPS livery. The body's done up in matte carbon fiber with gold details on the front bumper, hood, flanks, diffuser, and rear stabilizer fin. Otherwise it's essentially the same as any other example of the Super Trofeo Evo, introduced last year as an enhancement to the ten-cylinder sports racer. Just what the point is in offering a "special edition” of a vehicle that would ostensibly already be painted (or wrapped) to the gentleman racer's specifications, we don't know. 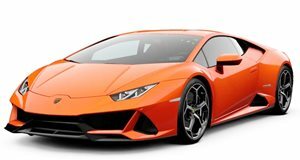 But we suppose its inclusion in the annals of special-edition Lambos just goes to show how central the sales of racing cars has become to exotic automakers.